Born in 1947 in Cleveland, Ohio, Stephen R. Donaldson lived in India (where his father was a medical missionary) until 1963. He graduated from the College of Wooster (Ohio) in 1968, served two years as a conscientious objector during the Vietnam War, doing hospital work in Akron, then attended Kent State University, where he received his M.A. 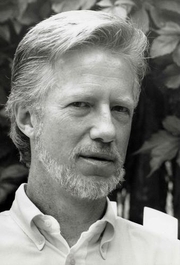 in English in 1971.After dropping out of his Ph.D. program and moving to New Jersey in order to write fiction, Donaldson made his publishing debut with the first "Covenant" trilogy in 1977. That enabled him to move to a healthier climate. He now lives in New Mexico.The novels for which he is best known have received a number of awards. However, the achievements of which he is most proud are the ones that seemed the most unlikely. In 1993 he received a Doctor of Literature degree from the College of Wooster, and in 1994 he gained a black belt in Shotokan karate from Sensei Mike Heister and Anshin Personal Defense.After completing the five-book, seven-year Gap sequence of science fiction novels, Donaldson spent quite some time "on vacation." However, he has now returned to work. His most recent book prior to The Man Who Fought Alone was a second collection of short fiction, Reave the Just and Other Tales. He is currently hard at work on "The Last Chronicles of Thomas Covenant". Stephen R. Donaldson's book The Last Dark was available from LibraryThing Early Reviewers. Stephen R. Donaldson's book Against All Things Ending was available from LibraryThing Early Reviewers. Stephen R. Donaldson is currently considered a "single author." If one or more works are by a distinct, homonymous authors, go ahead and split the author. Stephen R. Donaldson is composed of 8 names. You can examine and separate out names.